John Law was a Scottish banker who emigrated to France and became financial adviser to Louis XV. He eventually gave King Louis ample reason to wish that the Scot had never left his native land. Law recommended the establishment of La Banque Royale which became commonly known as La Banque de Law. This bank received all of the King's revenues against which it issued notes in ever-increasing quantities. John Law also engineered the setting up of the Company of the West (later the Company of the Indies) which controlled the foreign trade of France, including Louisiana and New France. 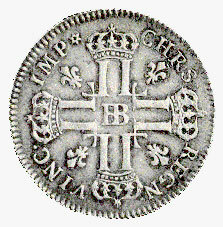 In 1719 John Law was given the sole right to coin the national currency. The value of the shares of the Company of the Indies rose rapidly from 500 livres per share to 20,000 livres. Complete collapse of his schemes came in 1720 with the bursting of the "Mississippi Bubble.'' Law left France in disgrace in 1720. The "John Law" coins were issued in copper, silver and gold and circulated to some extent in New France. The piece illustrated, from the National Currency Collection of the Bank of Canada, is a silver livre of about the same size and value as an English shilling.